Chilly wind means we are well into the sweater weather. Time to take those comfy sweaters for style slump. For working women, a sweater is an integral piece of clothing as it can be styled in every possible way. 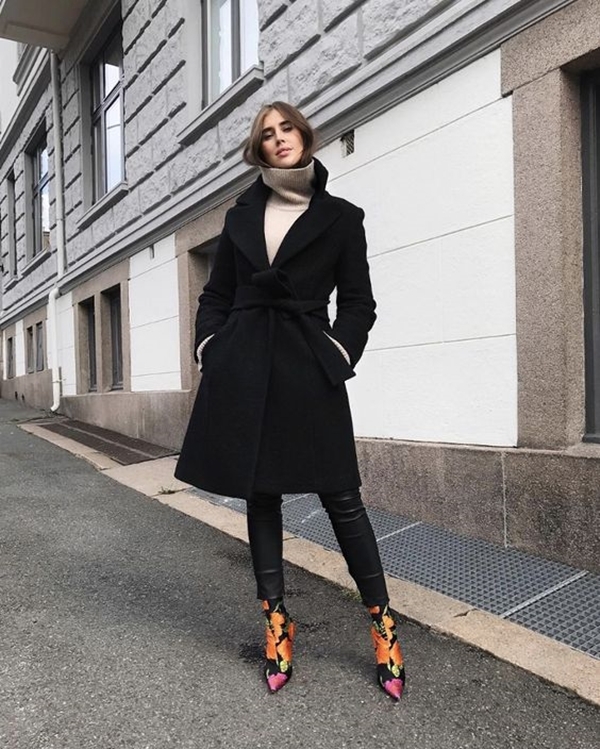 It can be tucked inside a skirt, draped over pants, paired with suits – making it the most attractive and lazy way out of winter clothing. Sweaters not just keep you warm but make your work outfit look un-boring and attractive. Every woman should have a set of sweaters with some basic and some beyond the basic sweaters for easy styling. Nail the winter dressing with attractive ways to wear sweater in work places. Which Sweater To Buy For Office? Before we begin with attractive ways to wear sweater in work places, the most common dilemma is which sweater to buy. Thanks to super responsive air conditions in office that almost froze the office desk. As soon as we enter the super cold office area, we wish of having 100 layers on. To keep you warm and productive, buy some splurge-worthy sweaters with colours like – black, dusky, maroon and tan. For less chilly days, go for lightweight simple cardigans. You can also wear print, but make sure the print is subtle and not loud. Sweaters are the timeless clothing item that you can wear seasons after seasons. They keep you warm and chic in the fall and winter season. 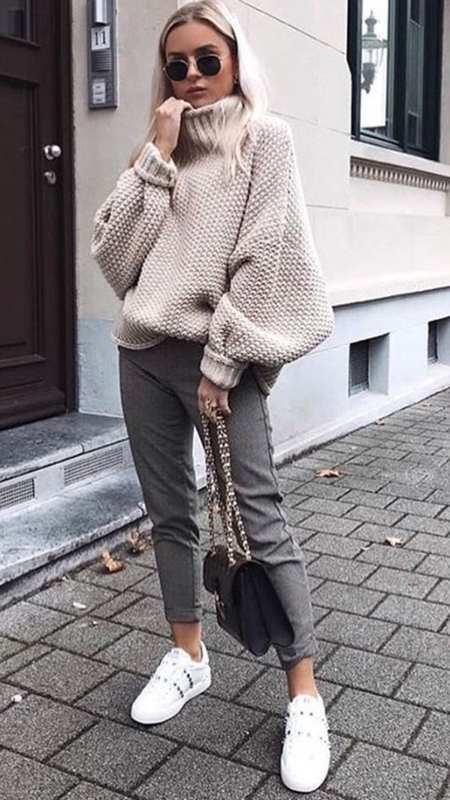 There are so many options in sweaters for working women like pullovers, lightweight sweaters, cardigans, casual hoodie, turtleneck sweaters and chunky knits. But the most attractive ways to wear sweater in work places is picked the perfect sweater according to your body type. Hourglass body shaped women should avoid boxy sweaters. One of the most attractive ways to wear sweater in work places is matching them with skirts. (Preferably flared skirts) To add some interests go monochromatic. Architectural skirts paired with chunky sweaters have made every work outfit chic-street and elegant. Sweaters that flare away from the waist are the perfect sweater to match with the dresses. Loose and long sweaters go along with the flared dresses. To draw attention to your outfit, pick various prints, textures and detailed sweaters to pair with your casual dresses. When the chilly winds are brisk and not freezing, you can also go for sweater paired with the casual work pants. These attractive ways to wear sweater in work places are the cosy and fashionable option. 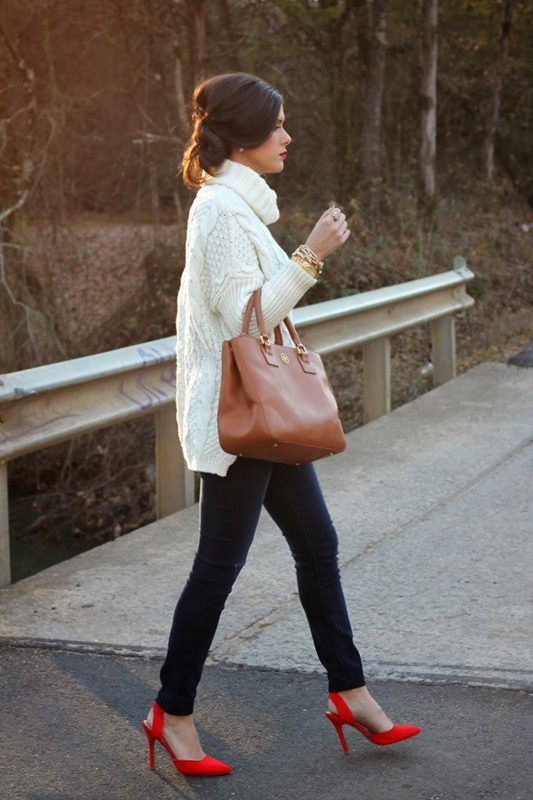 Don’t go for a boxy sweater for this outfit look and opt for sweaters that flatter your figure. Add a touch of edge to your attractive ways to wear sweater in work places with casual types of denim. Even the basic ensemble can be chic and classy with sweaters. They are such a fun element of any wardrobe. Pair a printed sweater or a dark solid colour sweater with your casual denim to make your winter fashion forward. A perfect outfit for a workday to night outs to girls, this outfit is lit in every way. Turtleneck sweaters go really hand-in-hand with the blazer and pant. This outfit looks polished, streamlined and professional. Wear a pair of oxford shoes and carry a sling bag to complete the boss lady look. Layering, layering and layering! To keep things from boring, working women can layer sweaters with jackets or blazers. Pick different colours, preferably contrasting ones to create an attractive look. This is one of the laidback attractive ways to wear sweater in work places. Add a hint of glam to the attractive ways to wear sweater in work places with accessories. Accessories add more detail to the outfit and make it look more elegant. If your sweaters are solid colours, wear a statement necklace to make it look dainty. Bags are always a working women’s best friend, carry a classy handbag to look sophisticated. 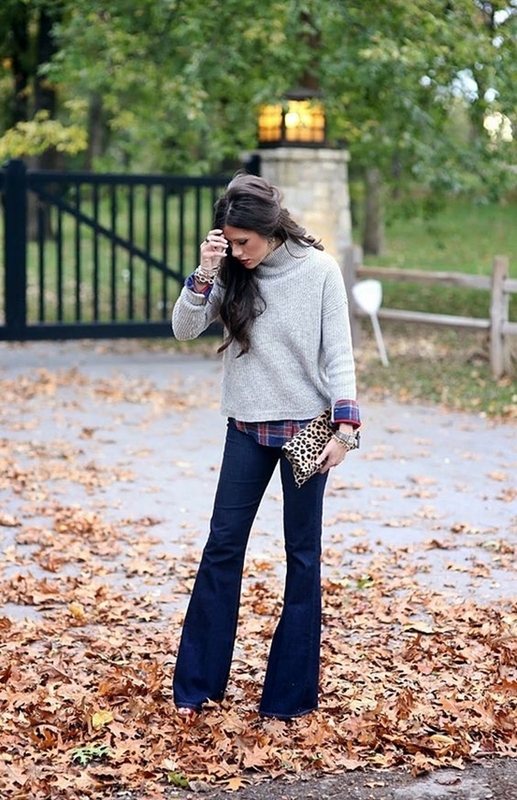 For an oversized sweater, wear a belt and cinch it by the waist for a perfect look. Here are some of the attractive ways to wear sweater in work places to keep you stylish in winters.